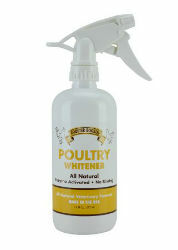 The ideal product for show bird enthusiasts! All natural, enzyme activated with brightening action. No bleach, dye or stripping agents. Safe, clean, and easy to use, no purple mess! Formulated to remove protein based stains. Works best when stain area is kept moist. Enzyme activated, works best over time.